Quite literally, actually. 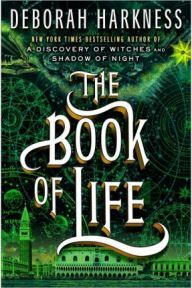 Deborah Harkness’ bestselling All Souls Trilogy started with A Discovery of Witches in 2011, before moving onto Shadow of Night the year after and finally coming to a satisfying conclusion with The Book of Life, finally released this month to an impatient readership. I was fortunate enough to be part of the London pre-launch event for the book, which served as a very timely reminder as to why I had enjoyed the first two books in this series so much and why I was so lucky to get an advance review copy (signed by Deborah to boot). For those of you new to this superior supernatural fantasy, let me bring you up to speed. 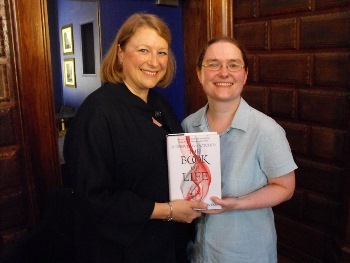 Last Friday evening, 4th July, I was lucky enough to be on the guest list for Headline’s launch event for Deborah Harkness’ latest release, The Book of Life. Having read, reviewed and enjoyed the previous two instalments in the Book of Souls trilogy (A Discovery of Witches and Shadow of Night), I was keen to expand on the interview I did with Deborah back in 2011 just as her first novel was about to be released. While I have seen many writers I admire at literature festivals, it is not often that I get chance to properly meet them and this evening was a fantastic chance to do just that. 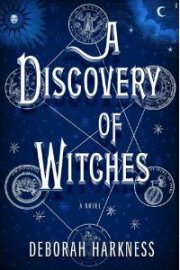 Back in September 2010, I was lucky enough to be sent a review copy of the debut novel of history professor Deborah Harkness. Entitled A Discovery of Witches, it introduced us to the supernatural world of witch Diana Bishop and vampire Matthew Clairmont – and admittedly yes, at the sight of the word “vampire” I did let out a small groan, expecting this to be another limp vampire love story straight out of the Stephanie Meyer school of pale, brooding male leads. 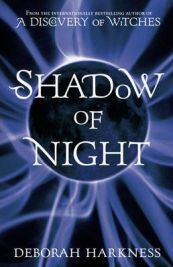 Thankfully I couldn’t have been more wrong and enjoyed the book immensely, the only downside being the long wait until the release of the second novel in what has now been formally named as the All Souls Trilogy: the eagerly awaited Shadow of Night. Due for release in the UK on 10th July 2012, your humble reviewer is once again privileged enough to receive a sneak preview manuscript from the nice people at Headline Books and has been spending the recent wet bank holidays immersed in this superior supernatural series. Deborah Harkness teaches European history and the history of science at the University of Southern California in Los Angeles. During her 28 years long academic career she was especially interested in history of magic and science in Europe between 1500 and 1700. She is passionate about wines and keen wine blogger. In 2008 she asked herself “if there really are vampires, what do they do for a living?”. Oh, Oh, Oh, It’s Magic!